Twenty students compete in the Mid-Atlantic European Union Simulation Program in D.C. This article originally appeared in the Department of Political Science newsletter. Fr. Dan Sweeney of Political Science and Dr. Teresa Grettano of English and Theatre led 20 political science and international studies students to Washington, D.C. to compete in the Mid-Atlantic European Union Simulation Program. 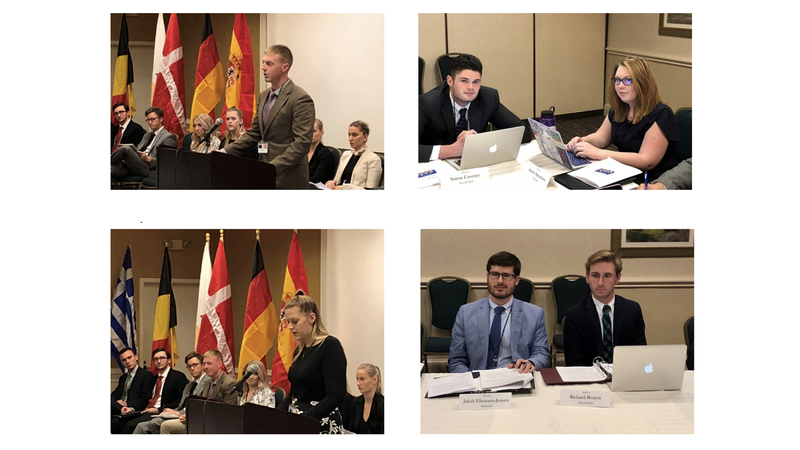 Given the large number of students enrolled in the course and simulation, University of Scranton students took on the roles of parliamentarians from two European countries, Ireland and Denmark this year. Similar to previous years, students rose above the talented competition. The EU course developed by Dr. Gretchen Van Dyke continues to be one of the most formative experiences of political science and International Studies majors. Dr. Van Dyke will return to teaching the course when she returns from her sabbatical in fall 2019. Read the Department of Political Science newsletter, here.